Kaley, our newest youngest Stewards from West Va. Top left, her Dad, Wil, a Camp Lejeune MarineResurrection Fern on fallen Red Cedar – top Spanish moss on fallen red cedar.Wild hibiscus , Red Cedar Berries, Scuppernong Grapes, Our Trash haul for the day. We had a delightful paddle on Frenchs Creek. It was different as is every paddle. This one was remote and wild. We never saw another human. We did see lots of wildlife including an abundance of ospreys and their nests. One small alligator, cormorants, egrets, blue herons, woodpeckers and one, I called him a shitepoke, but couldn’t find him in the book. We actually paddled three creeks. We were blocked by blown down red cedar trees upstream on Frenchs and Cowherd and Jumping Creeks. We feel they may have a possible access if cleared up to the bridges.All were wild and beautiful. The fallen red cedars with the bleached exposed roots are grotesque in their shapes and one can imagine all kinds of creatures in observing them. The weather was excellent in spite of the dire forecasts. We went swimming twice to cool off. Scratched for clams but without success. The Stewards were, Kaley, from West Virginia and her Dad, a Camp Lejeune Marine, and Dale Weston, from Jacksonville and the writer. Kaley is now our youngest Steward. She really seemed to enjoy the trip and was eager to find litter which was scarce in these waters. Most of the trash was at the put-in and consisted of discarded chairs. This Saturday, we join the Young Democrats of Carteret County in cleaning up Morehad City harbor. 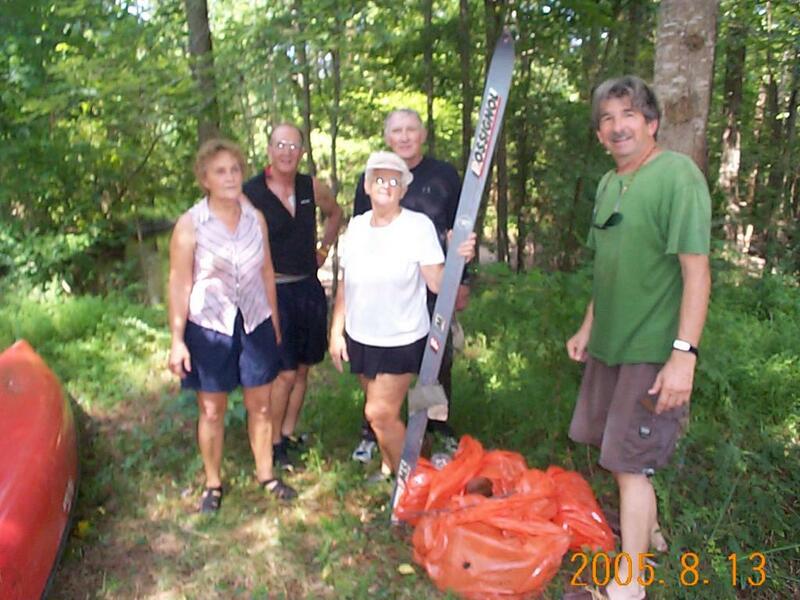 We return to Sugarloaf Island and will play leap frog along the islands’s shores picking up all trash and litter along the high tide line where it is deposited by the waves in the marshes and along the beaches.Sugarloaf is now a Morehead City Park. There is ferry service over to it. It is a beautiful island park and should never be trashed. 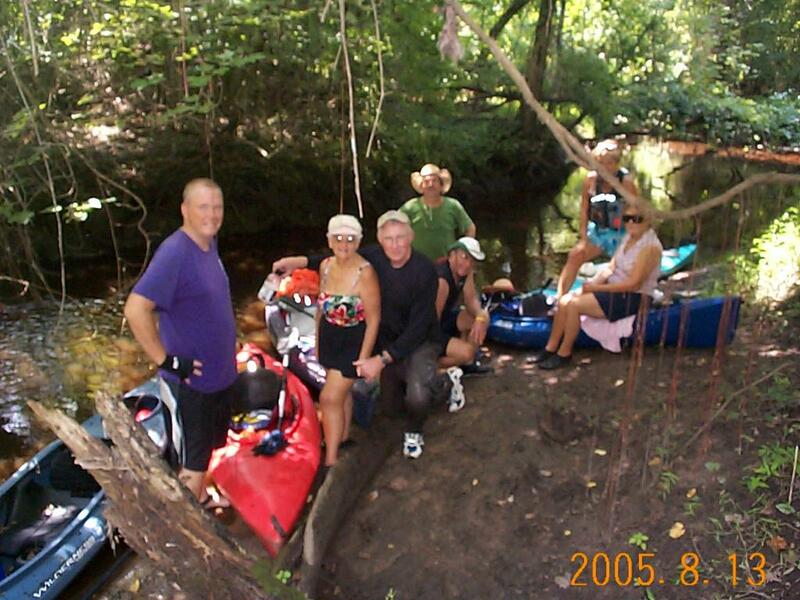 2005-08-13, Northeast Creek, Jacksonville, N.C.
Uppper left, L to R, Juila Miner from Oriental, Tom Fineco from NewBern, Marie Justen from Spooners Creek, Dale Weston from Jacksonville, Jim Stevens from New Bern.Upper Right, Bill Murray from Pine Knoll Shores, extreme left and Missy Tenhet from Oriental extreme right.Left, Dale getting ready to attack a group of blown down trees blocking our passage upstream. We put in off of Regalwood Drive which is at the NE shoulder of the new bridge on Piney Green Road over Northeast Creek.We were able to drive right to the waters edge and this gave us excellent access and safe off road parking. It is a natural good access just as it is. 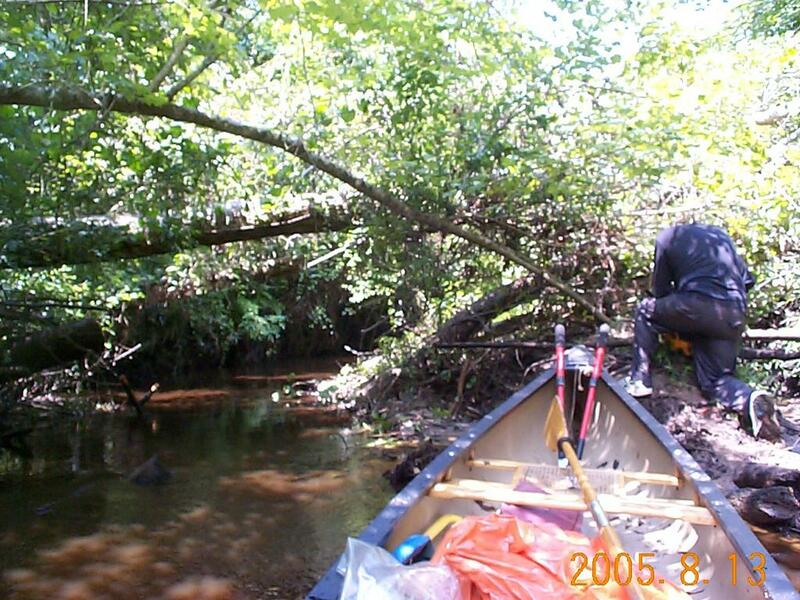 We hope the City of Jacksonville or Onslow County can accquire this spot for a permanent access to this new excellent Canoe Trail with take out at Northeast Creek City Park in Jacksonville.Our goal was to paddle upstream to Route 17 vicinty and hoped to find another access up there. We made it as far as the junction of Wolf Swamp and Northeast Creek. We encountered many obstructions similar to the above and Dale was able to cut through them with our chain saw. We all pushed and pulled the floaters and debris caught in the strainers At this point our time had run out and Dale was mighty tired.We turned around and “flew” back down the river . The volume and flow was execllent. The depth was over our heads in places. We were all amazed and wondered how this river maintained such a good flow when most other creeks are so low they are not canoeable at this time.This river will make one our very best Canoe Trails when it is cleared of all obstructions. Can you give us any help JR? We did encounter two small beaver dams. This week coming up. Wednesday, Freeman Creek if not “hot”. If “hot” then Frenchs Creek. Saturday, Sugarloaf Island. Details later.